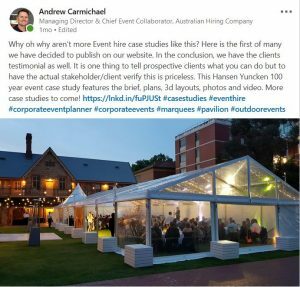 Why oh why aren’t more Event hire case studies like this? Here is the first of many we have decided to publish on our website. In the conclusion, we have the clients testimonial as well. It is one thing to tell prospective clients what you can do but to have the actual stakeholder/client verify this is priceless. This Hansen Yuncken 100 year event case study features the brief, plans, 3d layouts, photos and video. More case studies to come!